KTC won the title of "2018 Guangdong Export Band-name Enterprise"
Recently, the list of "2018 Guangdong Export Band-name Enterprise" has come out fresh, and KTC was on the list. 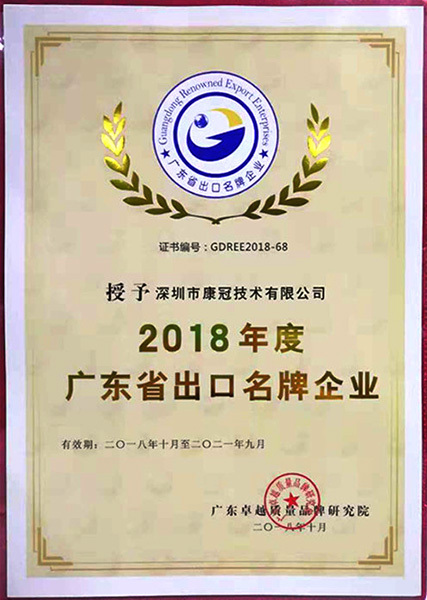 The selection of Guangdong Export Band-name Enterprise Province was organized by Guangdong Excellenct Quality Brand Research Institute under the guidance of Guangdong Commerce Department. Qualified enterprises applied voluntarily and filled in application forms and submitted application materials in accordance with the rules. After that, it was investigated and selected by Guangdong Excellent Quality Brand Research Institute. KTC has always adhered to the management idea of "honest management, high quality and good service", adhered to high quality line, and aimed at serving customers with the highest standards. High quality and high standard products have not only opened up the domestic market, but also obtained good reputation overseas. The products are exported to many countries and regions in North and South America, Europe, Africa, Australia, Asia, and the company has maintained good cooperation with well-known international enterprises. This honor is a high affirmation of KTC's export strength. KTC will also adhering to the original mind, improve the quality image and competitiveness, strengthen brand construction, and make the brand bigger and stronger.